Last summer the world was stunned by the famine in East Africa with thousands of children starving to death on the trek from Somalia to refugee camps in Ethiopia and Kenya. We can prevent a similar disaster if we heed the warnings in front of us. The Sahel region of Africa is today suffering from drought and conflict.This part of Africa includes the countries of Niger, Mauritania, Mali, Burkina Faso and Chad. Poor rains have meant that food production has been lower than usual in these already impoverished countries. The World Food Programme (WFP), which relies on voluntary donations, lacks funding for this crisis. 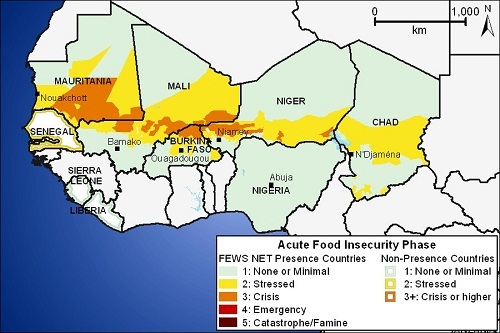 Denise Brown, the WFP director of Niger says, “We do not have enough resources, cash or food, to cover the lean season.” Without enough intervention the Sahel may fall victim to a famine. South Sudan, which just gained independence last year, may likewise follow. Continued conflict with its northern neighbor Sudan as well as internal conflict between rival tribes is causing a massive movement of displaced persons. Farmers have been forced away from their fields which harms food production. On top of conflict, a drought has hit South Sudan. WFP says nearly 5 million people are suffering from hunger. Should conflict continue, famine could strike the Sudan region. The U.S. and the international community need to support peace efforts to stop the violence. Diplomacy though must be accompanied by humanitarian aid. It is poor living standards that are a contributing cause behind violence taking place in the Sudan region. Two countries high on the list of U.S. foreign policy priorities, Yemen and Afghanistan, also suffer from severe hunger. In Yemen 22 percent of the population is afflicted with severe hunger, weakening that society as it tries to fight off Al Qaeda. The White House said in 2010 that humanitarian relief in Yemen was “woefully underfunded” and this trend has continued into this year. In Afghanistan, while donations from the U.S. and others have helped rescue the country from last year’s massive drought, a 362 million dollar relief and recovery operation by the WFP remains only 10 percent funded. Without food security, Afghanistan cannot develop and build peace, so it’s bewildering why food development initiatives do not get the support they need. Food aid programs are also relatively inexpensive when you match them against other plans. So these are not wallet breakers especially when countries team up to fight hunger similar to Herbert Hoover’s coordinated relief as the food ambassador after World War II. The U.S. announced last week that East Africa again suffered from low rains and aid will be needed to help Somalia, Ethiopia and Kenya, countries already weakened by last years’ drought and famine. Emergency aid, followed by programs to build up the resilience of the small farmer to drought, is the strategy that must be implemented. It’s a case of saving lives now but also planning ahead to feed the future. If we act now, we can save millions of lives in these areas. But fighting hunger is not often given a top priority within U.S. foreign policy. The Food for Peace program has repeatedly been threatened with cuts by Congress. This plan, signed into law by President Dwight Eisenhower, can play a very critical role in winning the peace today. If Food for Peace funding were increased to 2 or 2.5 billion a year, quite small compared to a 52 billion a year nuclear weapons program, it could help bring much-needed stability to a starving, desperate and impoverished world. Article first published in the Providence Journal and the Cincinnati Enquirer. Article published as Act Now and Avoid Summer Disaster of Hunger and Famine on Blogcritics.